Everyone knows that video and visual marketing is everyone’s new best friend. When you combine it with marketing automation, it makes for a very powerful partnership. Consider that Forbes says 75% of Fortune 500 executives view online video while they’re at work. Or that eMarketer says approximately half of marketers who use video in email campaigns see an increase in click-through rates, time spent reading the email, and sharing and forwarding. The fact is that B2B marketers who exclude video from their content program are making a colossal mistake. Why? Video gets watched – that’s why. They had a ton of video content and, like many people who want a killer video platform, purchased Vidyard. They took the proper steps of building out a library and landing pages. They knew they were paying for a video tool that can give very powerful insights, but ultimately they wanted serve up additional content. Video is expensive, after all. Gotta prove that ROI. But while they had built out an Interesting Moment in Marketo for a video watch, they weren’t doing truly anything actionable with it. The holy grail they were seeking? Leveraging video content and seeing a return. With great tools like Marketo and Vidyard, this isn’t as hard as many marketers would think. Our first step was to export the Vidyard stats to determine their top 20 most popular videos. From that list, we determined two videos that were the highest performing and also had relevant follow-up videos. Each video was embedded on a Marketo landing page. Then we built out a new channel and programs in Marketo to track each lead’s interaction with a given video. The outcome is that they can go in and determine for each video which leads in a known database have watched, and how far they got. Based on this information, if a lead doesn’t finish the video, marketing can send an email with a followup that either prompts the lead to finish, or send a video that may be more relevant. Marketo programs are utilized to track the length of video watched based on the information sent back from Vidyard. This helps marketing see which videos are engaging leads either partially, or all the way through. Once the individual leaves the video, Marketo is utilized to send a follow up email, specifically based on whether the video was completed or not. If the video was completed, the lead is sent matched content related to the original video. This allows us to serve up relevant content and further leverage additional video assets. If the lead doesn’t finish watching the video, we follow up with them to complete the video and also suggest additional content they might be interested in. All of the above is automated from the Marketo/Vidyard integration and allows us to immediately start proving ROI with video as a channel in a creative way. Bottom line, video, (for all its merits) is expensive and not always easy to prove ROI on. But by assigning these videos to content programs, we can attribute to marketing any deals it may influence though multi-touch attribution, which would show which videos were a piece of the pie that influenced someone to become a customer. As B2B marketers, we don’t have to stay stuck in the world of text-heavy content. We can have an energetic multimedia presence just like anyone else. And with the right video assets driving engagement, leads, brand elevation and more, smart marketers will jump into the game and find new ways to turn this medium to their advantage. As a marketing professional with over 15 years of hands-on experience in lead generation, digital marketing, public relations and channel marketing, Beth has enabled several results-driven marketing initiatives throughout her career. 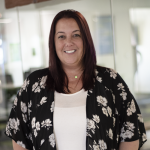 Beth’s passion for digital marketing solutions grew through her many years of having a strong commitment towards supporting all aspects of the sales process. Beth is a multitalented and motivated professional with a “pull your sleeves up” approach. Her positive attitude, personal integrity and respect of others are something she brings to every project. Born in Buffalo, you can often find Beth at the stadium or rink rooting for the Bills or Sabres. She also enjoys boating, fishing, snowmobiling and being outdoors in general.